I’m still wondering what I should do with my stairs now that I’ve taken the carpet off. 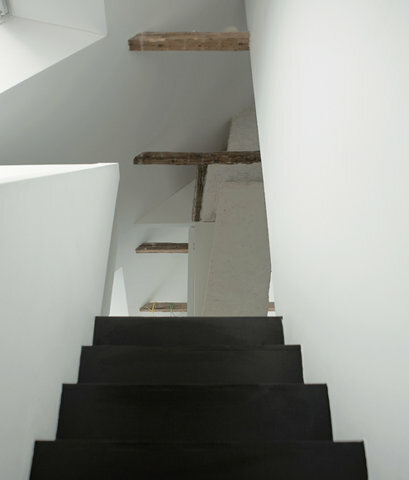 Should I leave them raw and paint each side white like these or paint everything in white…The jury is still out and until I’ve made up my mind, they will stay as they are….looking very very industrial but I like how simple and contemporary these black stairs look. Je suis toujours en train de me demander ce que je vais faire avec mon escalier maintenant que j’ai enleve la moquette. Est ce que je devrais les laisser brut et peindre chaque cote de la marche en blanc comme ceux-ci ou peindre tout en blanc…Pour longtemps, je n’en sais rien et tant que je n’ai pas pris ma decision, ils resteront brut, tres brut limite industriel mais j’aime beaucoup le look simple et contemporain de ces escaliers noirs. I was reading UK Elle this afternoon and saw stairs in white with a black wall and thought geez that is nice. but also this is nice. I think for me I like the contrast and then I vote for this one! I also like a stripe on the stairs like as if there is a line of carpet.. So you do not like theme just bare with white walls?